Rogaine® Subscribe includes the 1-month supply shipped every month. ROGAINE® is the #1 Dermatologist Recommended hair regrowth treatment. When you use Women's ROGAINE® Solution every day, you can revive hair follicles to regrow thicker, fuller, younger-looking hair. Easy to use: Apply minoxidil formula with included dropper to scalp areas with thinning hair. Clinically proven to regrow more hair in 3 months*. FDA-approved solution contains 2% minoxidil. in clinical studies of mostly white women aged 18-45 years with mild to moderate degrees of hair loss, the following response to 2% minoxidil topical solution was reported: 19% of women reported moderate hair regrowth after using 2% minoxidil topical solution for 8 months (19% had moderate regrowth; 40% had minimal regrowth). 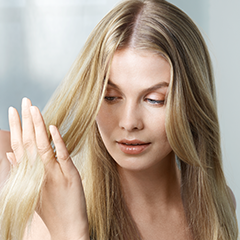 This compares with 7% of women reporting moderate hair regrowth after using the placebo, the liquid without minoxidil in it, for 8 months (7% had moderate regrowth; 33% had minimal regrowth). store at controlled room temperature of 20° to 25° C (68° to 77° F).